When a film deliberately sets out to be as offensive as possible, I generally find this works against it, at least as far as causing genuine offense is concerned. Mind you, I can’t honestly say I have ever found any actual, fictional movie “offensive” as such. So if that’s the main purpose of your film, you are largely wasting your efforts on me – and you’d better have something more to offer. Not sure that’s necessarily the case here. What we do have is the story of two serial-killers, Judge Taylor Limone (Bogue) and defense attorney Clara Lovering (Robbins), who have a passionate and murderous relationship. As a throwback to her abusive father, Limone lets her select their next type of victim by picking a paper slip from a bag, hence the title. As they slaughter their victims in a variety of methods, no less “eccentric,” shall we say, are the FBI investigators on their trail. Agent Dewayne (Diamond) has Tourette’s and uses physical contact with a psychic to obtain information about his cases. Agent Truman (Del Vecchio, who co-wrote this along with Robbins) is a mute paraplegic with a huge ego. It’s also an awkward combination of horror and comedy, that never quite meshes, with (entirely deliberate, to be fair) over-acting too commonly used as a substitute for actual laughs, and some scenes, such as the Bible class waiting for a bus, that should have been left on the cutting-room floor. That said, Bank demonstrates a deranged imagination for the gore, with some impressive sequences that combine practical effects and CGI to impressive results – the chainsawing-up of an all-girl band was particularly well-done. The performances here are also uniformly intense and committed, and if my interest was circling the drain of boredom at some points in the second half, those helped ensure the movie didn’t swirl down it entirely. However, it feels more like a grab-bag of “wouldn’t it be cool if…” ideas, rather than an actual movie, and the energy apparent in the early going becomes more like the bouncing of a hyper-active child by the time the credits roll. 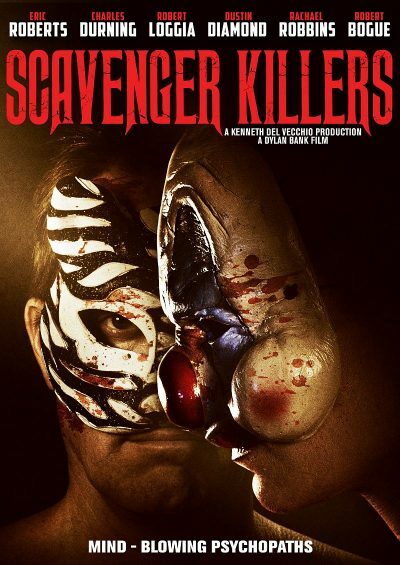 Scavenger Killers is available now, through Midnight Releasing.